Germany will have a representative in the America's Cup for the first time after United Internet Team Germany beat the entry deadline by hours. The German team, sponsored by internet provider United Internet, was the 10th syndicate accepted to challenge Swiss holders Alinghi in 2007. "We're glad they beat the deadline," said an America's Cup spokesman. "Germany has a tremendous sailing heritage and has enjoyed success at all levels of yacht racing." The Germans will be led by Danish skipper Jesper Bank, a twice Olympic gold medallist and previous America's Cup skipper in 2002/3 with Victory Challenge. A challenge dossier from China Team also arrived shortly before the deadline and will be closely evaluated by the Societe Nautique de Geneve, the defending yacht club, before the team is accepted as a challenger. America's Cup holders Alinghi, of Switzerland, will race off against the winner of the Louis Vuitton Challenger Series in Spain. American syndicate BMW Oracle Racing, bankrolled by software billionaire Larry Ellison, is the so-called "challenger of record", the team that officially laid down the challenge to Alinghi for the next Cup. Former holders Team New Zealand, headed by Grant Dalton and skippered by Dean Barker, will feature Britain's two-time Olympic champion Ben Ainslie. Italy's entries comprise the +39 Challenge, which includes Briton Iain Percy, the Luna Rossa Challenge, and Team Capitalia, formerly Mascalzone Latino. South Africa will be represented by Team Shosholoza, France's entry is the K-Challenge, Victory Challenge is the Swedish team and Desafio Espanol will race for Spain. There is no entry from Britain after Peter Harrison's GBR Challenge folded in November 2004 due to a lack of partner sponsors. 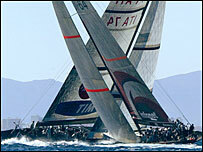 A series of regattas, or "Acts", are scheduled for the run-up to the challenger series in 2007 to boost the event's profile and provide competitive testing conditions for the teams.